Two way screened weatherproof external / Mast Head splitter. 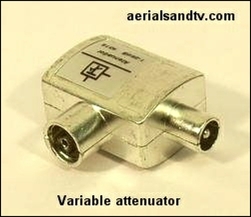 This unit may be mounted on the aerial pole (strap supplied) or on the wall. Loss 3.5dB. Power pass on both legs. Frequency range 47 to 862MHz Earth bonding terminal. 2 year warranty on this product. The 3 F connectors required are included in the price, and they`re decent ones. For this product the P&P is cheaper if you phone the order through ! These Four Way Mains Amps are suitable for running two to four TVs. They are fully screened and the line power is a full 100mA, not just 50mA.... The amps have separate inputs for TV + FM and DAB. 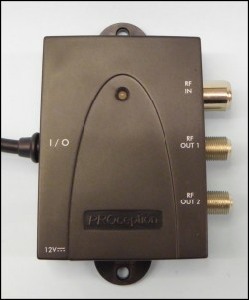 If a suitable FM/DAB aerial is connected to the second input, each of the outputs can then supply a TV and /or an FM or DAB tuner, either via a 2 way splitter or (ideally) a “Set Back Diplexer”. Earth bonding terminal. Fully screened This amplifier uses Co Ax connectors (not supplied). 2 year warranty on this product. For this product the P&P is cheaper if you phone the order through ! If the 4 way amp is out of stock we`ll send you a 6 way for the same price. Fully screened Mast Head Amp with inter-stage variable gain. The amp will not pass FM/DAB, if required this should be diplexed in after the amplifier. 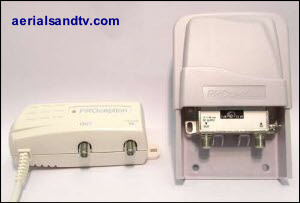 The amp can supply one TV point directly or a number via a splitter with power pass. As an example, if the amp were turned up to 22dB and then sent through an 8 Way splitter (with a through loss of 12dB) you would still have a “nett gain” of 10dB per output, less any cable loss. 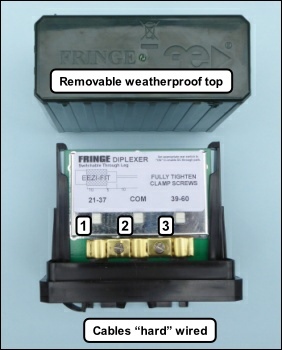 The weatherproof enclosure makes it equally suitable for mounting on the aerial mast, or on the wall, or in the loft. 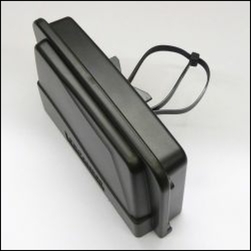 The plastic housing is removable, if required, so the amp unit can be screwed directly to any surface, e.g a loft joist. The amp is not cascadable. Max recommended distance from PSU to amp would be well over 250m. Earth bonding terminal. Also see four output version. The PSU, if required, is also screened and it has short circuit protection. The seven * F connectors required are included, and they`re decent ones ! Fully screened Mast Head Amp Kit with variable gain by attenuation on the input. The unit amplifies 470MHz to 862Mhz, i.e. it will not pass FM/DAB. If required this should be diplexed in after the amplifier. 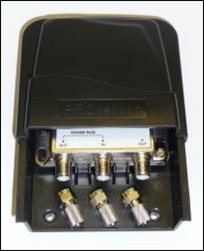 This amp can supply four TV points directly or more via a splitter(s) with power pass. 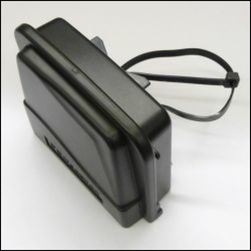 The weatherproof enclosure makes it equally suitable for mounting on the aerial mast, on the wall, or in the loft. The PSU is also screened. Max recommended distance from PSU to amp would be well over 250m. This amp is cascadable up to 30mA. NOTE : This unit is only suitable for those in poor signal areas as strong signals at the input may result in cross modulation interference. Unless particularly long cable runs are involved we would normally advise the use of an amplifier (such as the one above) of lower gain, able to be turned down as far as possible, and capable of accepting larger input signals, see the article on this subject. In other respects the two units operate in a similar manner, including PSU on any leg. The seven F connectors required are included, and they`re decent ones ! When considering buying an amp (or “booster”) remember the basic rules ! These Eight Way Mains Amps are suitable for running two to eight TVs and also provide a “Full” output of 18dB which can be used in conjunction with a splitter to supply more points. 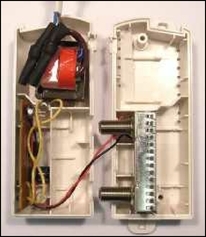 If this output is not used the supplied 75 Ohm terminator (illustrated) should be installed in the output. The amp has line power and at a full 100mA, not just 50mA.... The amps have separate inputs for TV + FM and DAB. If a suitable FM/DAB aerial is connected to the second input, each of the outputs can then supply a TV and /or an FM or DAB tuner, either via a 2 way splitter or (ideally) a “Set Back Diplexer”. Earth bonding terminal and fully screened. This amplifier uses Co Ax connectors (not supplied). Protection = No short circuit protection. All our PSUs, amps, splitters and wall plates are screened to minimise interference. 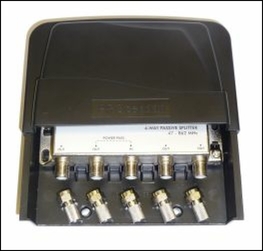 These Eight Way IR return path (Digi Link) Amps are suitable for running two to eight TVs. 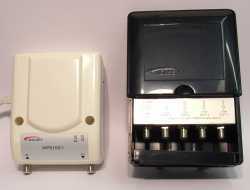 All eight outputs can accept a Digi Eye (with short circuit protection). The amp is fully screened and have separate inputs for TV + FM and DAB. If a suitable FM/DAB aerial is connected to the second input, each of the outputs can then supply a TV and /or an FM or DAB tuner, either via a 2 way splitter or (ideally) a “Set Back Diplexer”, though there would be no Digi Link capability through the diplexer. Note that post Aug 2013 Sky boxes require an IO link ! Earth bonding terminal. 2 yr warranty on this product. The ten F connectors required are included in the price, and they`re decent ones. 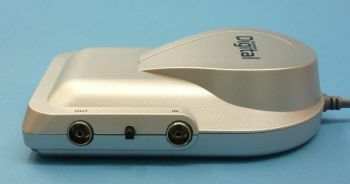 Digi Eye for remote operation of a Sky box from another room, see article on the Digi Link system. The unit has an LED to confirm the presence of the 9V supply from the Sky box and the cable from the Co Ax inline junction (which has a Male and a Female Co Ax) is approx 35” long. Note these are not the budget type DigiEyes which we have found can give unreliable operation. Four way screened weatherproof external / Mast Head splitter. 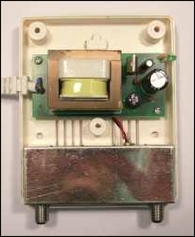 This unit may be mounted on the aerial pole (strap supplied) or on the wall. Power pass on all legs. Frequency range 47 to 862MHz. Loss 7.5dB. The 5 F connectors required are included in the price, and they`re decent ones. All our splitters are metal (not crappy plastic.....) which not only makes them more robust but it also means they`re screened. All the F connector splitters have power pass on any leg, but the CoAx splitter is not recommended for power pass. Splitters are not usually suitable for the Sky Digi Link system. Any F connectors required with our splitters (or amps) are included in the price, and they`re decent ones ! Figures are for UHF (TV), see article on splitters. The UHF/VHF twin input mast head amp is no longer available. In the mean time, our recommendation is to diplex your FM and/or DAB signal into the output of our UHF (TV) masthead amp. The diplexer has through power on the TV leg to achieve this. 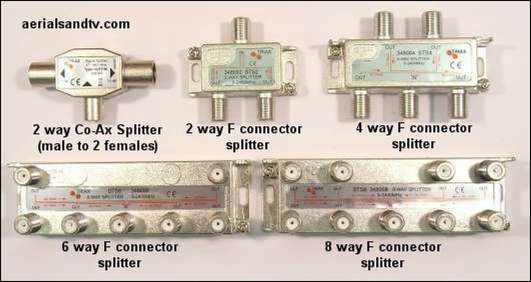 F Conn splitters : freq response 5 to 2400MHz., all have Earth bonding terminals. If buying an F connector splitter it is worth considering the purchase of an F conn B to B. Power / launch amp. See Launch Amps. A high gain amplifier designed to supply systems up to 100 points via splitters and/or taps. It is equally suitable for preamplifying signals to be transmitted down particularly long cable runs. Features 4 inputs UHF / UHF auxilliary / DAB / FM, each is separately adjustable for gain. Note : the AUX input is not recommended for a second TV aerial (use a UHF/UHF diplexer onto the main UHF input for that), it is for CCTV or some other modulated signal. 4dB equalisation slope to compensate for unequal frequency dependent cable/splitter loss. Interstage gain control on the UHF input, front end on the other three. Earth bonding terminal. 2 year warranty on this product. Also see one way mains amp. NOTE : This amp (in fact no amp) is not going to turn a poor signal signal into a good one just because it`s high gain. It`s meant for larger distribution systems or preamplifying signals before a long cable run. For these products the P&P is cheaper if you phone the order through ! The four F connectors required are included in the price, and they`re decent ones ! The amp and the PSU are also available separately. This fully screened Mast Head Amp with inter-stage variable gain is suitable for 1 to 4 TV points. The amp will not pass FM/DAB. If required this should be diplexed in after the amplifier. This amp can supply four TV points directly, or more via a splitter(s) with power pass. As an example, if the amp were turned up to 16dB and then sent through an four Way splitter (with a through loss of 8dB) you would still have a “nett gain” of 8dB per output, less any cable loss. The (removable) weatherproof enclosure makes it equally suitable for mounting on the aerial mast, or on the wall, or in the loft. This amp is not cascadable. Earth bonding terminal. Max recommended distance from PSU to amp would be well over 250m. The PSU, if required, is also screened and it has short circuit protection. 2 year warranty on these products. Specification for the 6 way mains amp is exactly the same as the 8 way amp (below). If the 6 way amp is out of stock we`ll send you an 8 way for the same price. Fully screened taps. 5 to 2150 MHz . Power pass on the through output, and earth bonding terminal. Supplied with 3 Quality F connectors. * The 8dB tap is 5 to 862MHz and has no power pass. Sample application of a tap. be mounted outside. Power pass on the UHF/TV leg. equivalent quality may be substituted. The three F connectors are included, and they`re decent ones ! * The lower leg actually accepts signals from 47 MHz upwards (i.e. it passes FM, DAB & Digilink). Female F to female F "in line" grouped filters. Through loss 1 to 2dB. Out of band rejection 20 to 30dB+. Supplied with 2 Quality F Connectors. 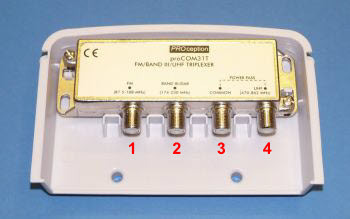 If CoAx connections are required order 2 x Male F to Female CoAx adapters. See article on use of filters. Also suitable as a high efficiency 4G filter. Outdoor/Mast Head Triplexer to combine or separate TV and FM and DAB. It is not necessary to use all the inputs/outputs, e.g. if you only want to combine TV & DAB, or FM & DAB. The unit is fully screened and its (removable) weatherproof enclosure means it can be mounted outside if required. This triplexer can also be used to separate FM and DAB signals where your tuner has separate inputs for each. Under these circumstances the TV leg would be unused, unless a TV signal was present (and required) obviously ! Earth bonding terminal. If a Half Wave Dipole aerial (for FM and DAB) is combined with a TV aerial a mast head diplexer should be used rather than this triplexer. See diplexers. 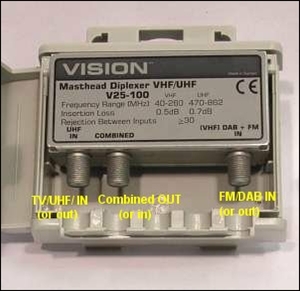 Note : If an aerial is connected to the FM input any DAB signal will be filtered out, similarly, any aerial connected to the DAB input any FM signal will be filtered out, also see VHF + UHF diplexer. Occasionally an alternative model of equivalent quality may be substituted. The four F connectors required are included, and they`re decent ones ! Terminators for unused outputs on amps, splitters or diplexers. Note that our 6 way and 8 way mains amps are supplied with a terminator for the Full Output. Not suitable for use with IR return / Digilink amps. phone the order through ! To combine or separate TV and FM and/or DAB. It should be noted that not all diplexers (or amps come to that) pass DAB on the FM input, all of our amps and diplexers do. This unit does not have 12V power pass (for a M/Hamp). 1 Male CoAx to 2 Female CoAx. Unscreened (the only unscreened product we sell, we cannot find a screened one to stock….). Variable from 1 to 22dB. 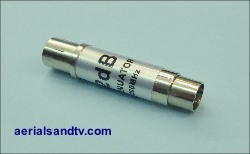 NOTE : purchasing 6db & 12dB fixed value attenuators (CoAx or F conn) then gives the option of 6db or 12dB or 18dB total attenuation and is therefore an alternative to a variable attenuator. 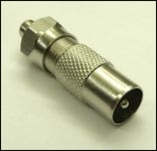 These attenuators can be useful in discovering if you have sufficient signal to use a splitter (as opposed to an amplifier). If your signal is still fine with one of these inline (see through loss of splitters) a splitter will be fine, an amplifier is not required. For all these products the P&P is cheaper if you phone the order through ! 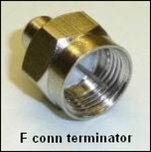 The items below are as above but Male F connector to Female F connector. If you need a 2 or 4 way splitter with all the connections on one side buy one of the outdoor splitters, the weatherproof enclosure can be removed if necessary. 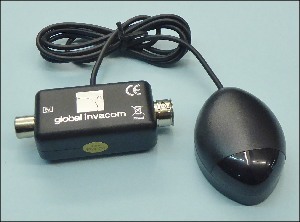 Internal Terr + Sat LNB diplexer to combine or separate Terrestrial (TV / FM / DAB) and a satellite LNB feed. This unit only has power pass on the satellite leg. 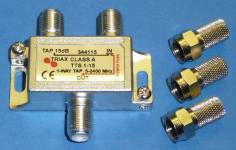 See article on Diplexers, including UHF one way and satellite the other ! and they`re decent ones ! UHF/TV input (or output) at 470 to 862MHz (loss approx 1dB) with power pass. Combined output (or input) plus power pass. Our One Way Mains Amps ("boosters") have switchable (interstage) gain and are fully screened. These amps are well suited for pre amplifying signals prior to a splitter or long cable run. They are actually simplified launch amps so can handle large signals. The amps can supply literally dozens of TVs if required subject to sufficient signal at the input. Screw holes for attaching to a wall if required. See Mains Amps. For this product the P&P is slightly cheaper if you phone the order through ! Note ! It can matter which way this splitter is connected. 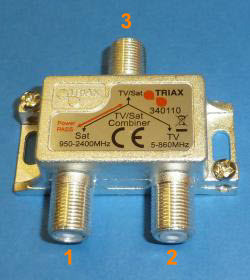 These Four Way IR return path (Digi Link) Amps are suitable for running two to four TVs. 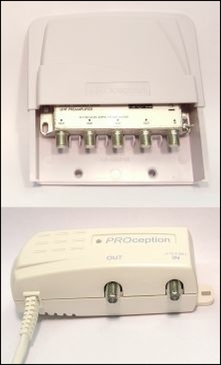 All four outputs can accept a Digi Eye (with short circuit protection). The amp is fully screened and have separate inputs for TV + FM and DAB. If a suitable FM/DAB aerial is connected to the second input, each of the outputs can then supply a TV and /or an FM or DAB tuner, either via a 2 way splitter or (ideally) a “Set Back Diplexer”, though there would be no Digi Link capability through the diplexer. Note that post Aug 2013 Sky boxes require an IO link ! Earth bonding terminal. 2 yr warranty on this product. The 6 F connectors required are included in the price, and they`re decent ones. I/O link Sky boxes supplied after August 2013 require an I/O link to restore the RF modulator / Digilink functions. It is connected to the I/O port at the rear of the Sky box via a 10 pin mini DIN. This I/O link will run up to two Digieyes (note that some I/O links will only run one eye) but if more than that number is required a Digilink / IR return amplifier must be used. Note that remote powered digilink amps will require a PSU (available separately, see below) to be plugged into the I/O link because the Sky box cannot provide enough current for this. Note that not all I/O links have this DC input capability, this one does. Read this report about possible low output on Sky supplied I/O links. Note : the PSU is only required if the I/O link is being used to power a remote amp. NOTE : purchasing a 6db and a 12dB fixed value attenuator gives the option of 6db or 12dB or 18dB total attenuation, this is an alternative to a variable attenuator. The 12 / 2 tap is no longer available. Three Way version of our one way amp, thus it also has switchable (interstage) gain and is fully screened. These amps are well suited for pre amplifying signals prior to a splitter or long cable run. They are actually simplified launch amps so can handle large signals. The amps can supply literally dozens of TVs if required subject to sufficient signal at the input. Screw holes for attaching to a wall if required. See Mains Amps. 1 Input (or output) of lower frequencies. 2 Output (or input) of combined signal. 3 Input (or output) of higher frequencies. These three TV/UHF + TV/UHF diplexers may be mounted on the aerial pole (strap supplied) or on the wall, they are equally suitable for indoor use. The through loss is around 1dB, apart from on the “shoulders” of the splitting frequency. Cross channel rejection is about 20dB. The units can also be used as high efficiency filters, using a 75 Ohm resistor (not supplied) to terminate the unused leg. Power pass switchable (on or off) on either leg. We can source alternatives, please phone for details.